On Wings of Eagles: What Does God Say About True Treasures? Modern-day treasure seekers think they have found the ship and sunken treasure of Captain Kidd, a famous pirate who sailed the high seas in the late 1600s. They think his ship got off course and sank off the coast of Madagascar near East Africa, and they hope to find gold when they explore it! Sometimes we are looking for treasures, too, like a better bike, a new doll, a new car or a new house. But these aren’t true treasures. 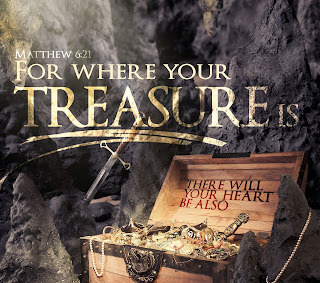 To discover true treasure, we need to set a course for God’s Word and start exploring! Jesus is saying that a happy life doesn’t depend on the things we have. The true treasures that make us happy come from loving Jesus and loving others. How can you find true treasure? Here are a few ideas! • Make and give a gift to a friend. • Share your things with someone who doesn’t have as much as you. Dear Lord, thank You for all the good gifts You have provided for us and our family. Help us take care of them and know how to help others who have less. Thank You for teaching us about true treasures, like You, my family, friends and Your creation. In the Name of Jesus, Amen. Labels: What Does God Say About True Treasures?